Welcome to the Ash Class blog! : More Ash Class champions! Well done Ella!! I was there too! I think I saw you i'm not sure. I was helping my mums friend run a Glitter Tattoo Stall! Did you see that pink dalmatian? Well done Ella, what a great talent to have! I think you need to come and visit my dog Gizmo and train him to behave as well as Indie! Well Done Ella, that is amazing. How many people were in the competion? Your dog looks like one of the dogs who compete in competions. Well Done! 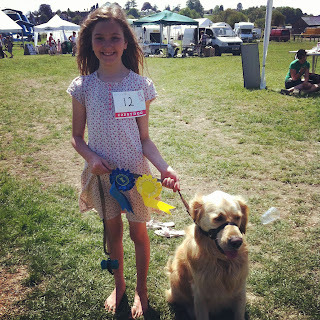 Well done Ella and Indie!What things did you have to do at the dog show to come second. It certainly has! I can play the flute and do Glitter Tattoos! Do you have any talents?